At 4:30am, we got a weather advisory. 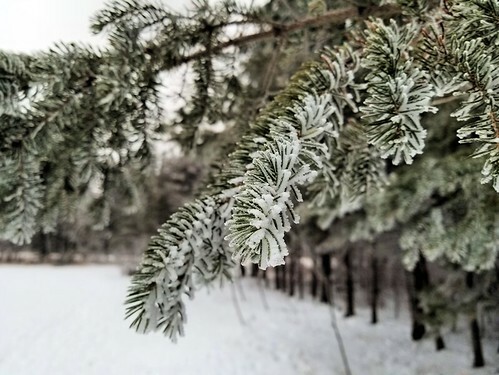 A fog had rolled in, covering most of the province, with visibility dropping to near zero. 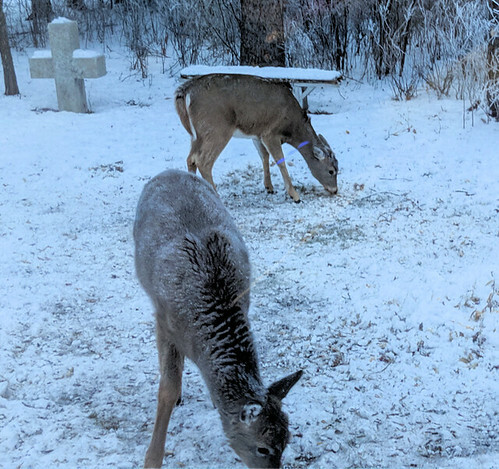 My husband got this first one, of frosty deer outside our living room window. Just look at that back! Then it was time for me to go out and do my rounds. The water bowl in the sun room was completely dry. 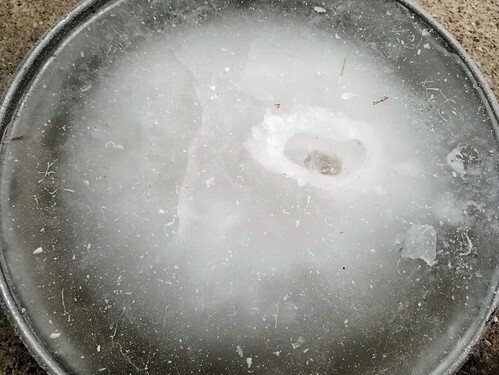 You can see where the cats tried to lick through the layers of ice, to get at liquid water below. I’m so glad we figured out a way to keep water liquid for them in the sun room! Kitty cats, inside and out! The Outsider and Bob like to stay at the inside food bowl, and I’ve been able to pet both of them. Even Bob is starting to let me pick him up and cuddle him, though he’s still not quite sure if he likes it or not! He sort of pushes back against my hand, looking at me with his wonky eyes. Such a cutie! 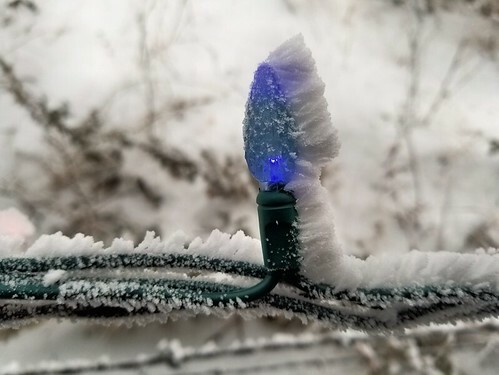 Everything around the yard was looking absolutely magical. The hips on these white roses of my mother’s are so very dark, making for quite a dramatic appearance. A bunch of grosbeaks settled into one of the ornamental apple trees while I was putting away the feed buckets, but flew off before I could try for a photo. It was so gorgeous to see the bright red of the males against the white, frost covered branches! 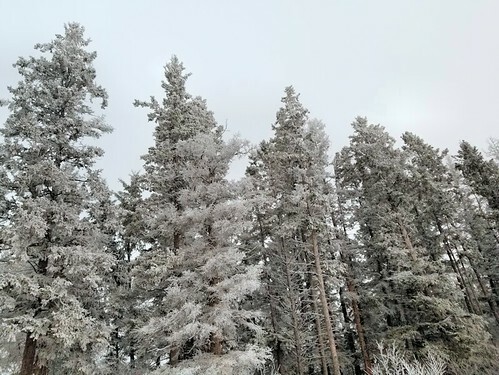 The spruce grove looked amazing. 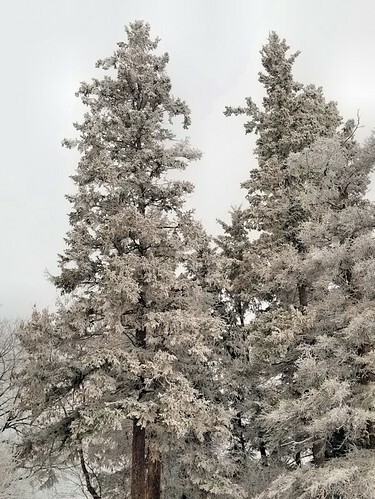 I noticed as I went around the north side of the grove, that the frost was under the spruce tips, rather than the top. It’s usually the other way around. Butterscotch was insistent on being picked up! 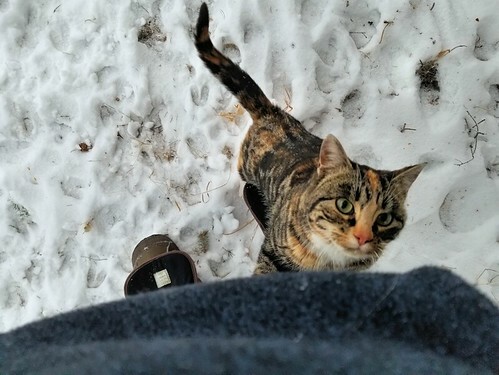 As soon as I did, she started happily licking my fingers and face, as if to say thanks for getting her out of the cold snow! While I was taking photos one-handed, I put my phone in my pocket to continue, only to feel something rubbing against the back of my leg. It was Beep Beep, wanting up, too! I fished out my phone to try and get a picture, twisting around to try and see her. Just as I did, she made the jump for it. She smacked her head, right into my phone, knocking it into the snow, knocking herself back down into the snow!! 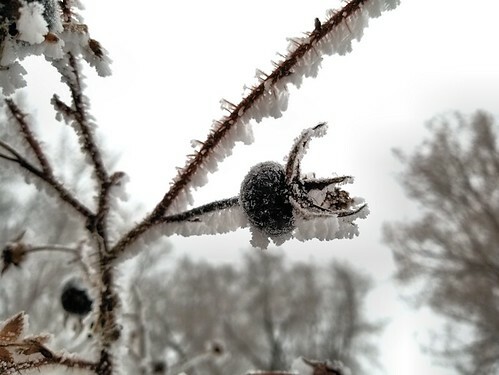 I was able to fish my phone out of the snow and brush snow off the outside, before it melted and got inside – with Butterscotch still in one arm! She finally jumped down because I kept moving too much, brushing the snow off. Thankfully, the phone is okay. Butterscotch ended up back in my arms, and Beep Beep escorted me as I walked. I could see she wanted up, but not while I was holding Butterscotch. I had to get some photos of the Christmas lights on the east fence line. It also illustrates how LED lights don’t heat up the way the old incandescent bulbs on the strings I took down would have. Less of a fire hazard, and one of the reasons I wanted to switch to LED, along with them being more energy efficient. Meanwhile, I’ve got plans to be working on some flavoured salts I plan to use as Christmas gifts. Looking over what I have, I’ve decided I need to go into town and get more Kosher salt, and some more gift sized containers. I want to make enough to keep for ourselves, as well as to give out as gifts! Yes, I plan to take photos and post recipes. 😀 Making them will be spread out over at least two days, and I hope to get them up very quickly after that. ← Critter of the day: got a snoot full!